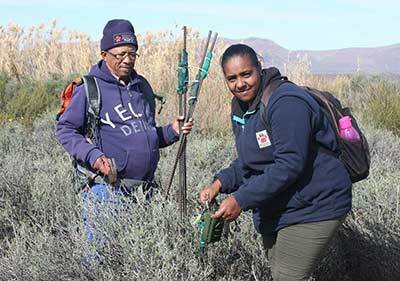 The South African National Biodiversity Institute (SANBI) has embarked on a major skills development and job creation pilot programme in 2013, Groen Sebenza, a Jobs Fund Partnership Project funded by the National Treasury. Groen Sebenza is aimed at developing priority skills in the biodiversity sector to create sustainable job opportunities for 800 unemployed graduates and non-graduates (school leavers with a matric certificate) for a period of two and a half years. Groen (in Afrikaans meaning green) Sebenza (meaning work in isiZulu) brings young South Africans from previously disadvantaged backgrounds together with experienced biodiversity professionals to learn, grow and eventually gain the competence and confidence to embark on rewarding and meaningful biodiversity careers. Groen Sebenza was officially launched by the honourable Minister of Environmental Affairs, Ms Edna Molewa, on 08 June 2013. The programme partnered with 43 host institutions across the country from all tiers of government, NGO’s and the private sector. Groen Sebenza has equipped the participating young people, called Pioneers, with various life and generic skills training e.g. computer literacy, workplace communication, career guidance, leadership and project management skills. In addition to this they have received relevant technical and occupation-specific skills at the host institution level linked to the jobs they were appointed in. The training was informed by research findings on SA’s shortage of critical workplace skills and experience in the biodiversity sector. To date 260 young people have been absorbed into permanent jobs either within their host institutions or beyond with the remaining group still looking for employment opportunities. Feedback from the employers is that the Groen Sebenza pioneers possessed a competitive edge over most candidates during recruitment and interview processes, hence their success in obtaining permanent positions. The recruited pioneers were appointed and trained in the following broad occupation categories i.e. Nature Conservation, Science and research, Environmental management and Planning, Law and compliance, Environmental Education, Communication and Community development. For potential employers in search of skilled youth to perform their biodiversity or environmental mandate, be it anti-rhino poaching, biodiversity planning and monitoring, research, education awareness and community development, water, air and waste management and compliance, the currently available 540 young people are well equipped to assist your organisation to deliver on its mandate. Dr Tanya Abrahamse, CEO of SANBI noted that she has seen this exciting cadre of young people developing from no-hopers to great achievers. However, there are still concerns that South Africa might fail to meet its targets to halt biodiversity loss and that opportunities for employment growth will be missed. Addressing these concerns requires the combined efforts of all stakeholders. It is with this in mind that we are making an appeal as a pilot partnership initiative to potential employers in government departments, NGOs and the private sector to find out more about this exciting and experienced pool of talent that was grown over 2½ years in the Groen Sebenza programme by contacting SANBI. Groen Sebenza is based on an “incubator model” giving 800 participating youth workplace experience through a structured mentoring programme, together with skills development and training opportunities for a period of two-and-a-half (2½) years. Five hundred and fifty-five (555) graduates and 245 school leavers (with matric certificate) referred to as ‘pioneers’ were placed with one of the 43 partner organisations for the duration of the project. The project commenced in May 2013 and will come to an end in October 2015. Primary residence and schooling in rural areas. A national matriculation certificate for the School leaver placement. A national diploma or first B-degree for the Graduate placement. A demonstrated and clearly articulated commitment to the environment. A commitment to a career development in the environmental sector. The Programme is governed by a Project Steering Committee which consists of senior representatives from the 43 Partner organisations or government departments as well as a Programme Management Committee. The following Task Teams have been set up to assist the Project with implementation. The programme is nearing its end and is not recruiting anymore. Contact Dikeledi Mahlangu or call 012 843 5101 if you have further enquiries about Groen Sebenza.